Chancellor Nicholas S. Zeppos addressed faculty at the Spring Faculty Assembly March 31. 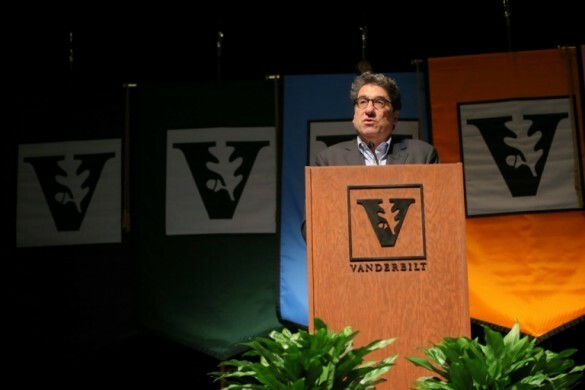 In his Spring Faculty Assembly address, Chancellor Nicholas S. Zeppos provided an overview of a year in which the university’s Academic Strategic Plan began implementation, the university and Medical Center moved toward establishing separate financial and legal entities, researchers advanced knowledge in a wide variety of fields, and the university examined what community looks like at Vanderbilt. The university and Medical Center will emerge from a restructuring period ready to launch the next fiscal year in a strong strategic and financial position, the chancellor told faculty following an annual overview by Faculty Senate Chair Richard Willis, professor of accounting, and a number of faculty recognitions and awards. The transition into separate entities, expected to be completed this year, has provided more flexible, nimble corporate structure for VUMC, the freedom VUMC needs to access debt markets for growth, and the ability to secure predictable funding for basic biomedical research and education, Zeppos said. The year also has been marked by important strategic appointments, including new leadership by George C. Hill in the newly appointed position of vice chancellor for equity, diversity and inclusion and chief diversity officer, and Padma Raghavan as vice provost for research. The chancellor also appointed two higher education fellows to create a pipeline of future leaders and a new class of 14 Chancellor Faculty Fellows. He highlighted an incoming class of notable new faculty, an impressive list of faculty discoveries, and he noted that in the past five years, Vanderbilt has established 78 new endowed chairs. This year has been marked by numerous opportunities for dialogue, Zeppos said. He pointed to town hall meetings, faculty and student forums and other discussions in which he, Vice Chancellor for Academic Affairs and Provost Susan Wente and other university officials have engaged. Topics have included the endowment, the student campus climate survey, the future of college athletics, and government regulation of higher education. The chancellor updated the faculty on what he identified in his Fall Faculty Assembly address as his most important priority – diversity and inclusiveness. That emphasis will continue, he said. Zeppos acknowledged the work of the Diversity, Inclusion and Community Committee, which he established last August. He said he is eagerly awaiting its report in June. “They’ve been out and about and listening, and really trying to engage in dialogue,” he said of the committee co-chaired by Professor of Astronomy and Senior Associate Dean for Graduate Education and Research Keivan Stassun and Professor of Law Beverly Moran. Zeppos said he also has appreciated input from students. “I think the students are pushing us. Maybe it makes us a little uncomfortable. That’s good. That’s what students are supposed to do,” he said. Meanwhile, Vanderbilt’s selectivity continues to improve as does its national and international standing. Kiplinger recently named Vanderbilt to its list of “Best Value Universities.” The university was ranked third among private universities and sixth overall. Zeppos mentioned he has established two other committees this year: one on the humanities and the other on biomedical sciences. The faculty assembly began with a presentation by Donna Ford, professor of special education, on the need for higher education faculty to educate future professionals and leaders to be culturally competent. The chancellor led a moment of silence in honor of Taylor Force, Justin Shults and Stephanie Shults. Force, an Owen Graduate School of Management student, was stabbed to death in a terrorist attack in Israel recently. The Shults, who were alumni, perished in the terrorist attacks at the Brussels airport.